My little girl turned seven in December and, to celebrate, we had a ballerina birthday party at our house. 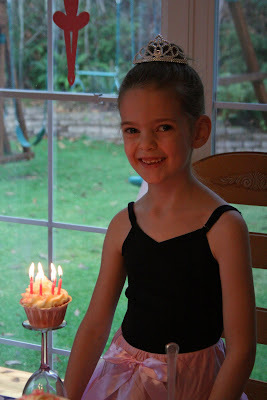 She has been in ballet lessons since she was three (literally--she won't even take the summers off, that is how much she LOVES ballet and dancing!) 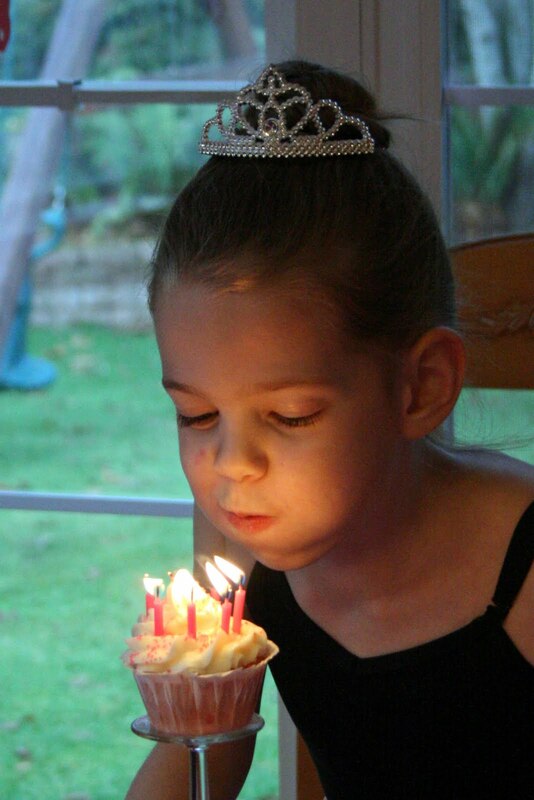 and currently her career aspirations are wavering between fairy princess and ballerina. Oh, to have such sweet dreams! I made her invitations using supplies I purchased at Michaels craft store. I was heavily influenced by the sweet tutu invitation I came across on A Little Loveliness, but I adapted it to fit my own needs. I printed my invitation details onto pink cardstock. Then I sketched a basic leotard shape and made a pattern that I then traced onto my pink cardstock and cut-out all of the invitations. 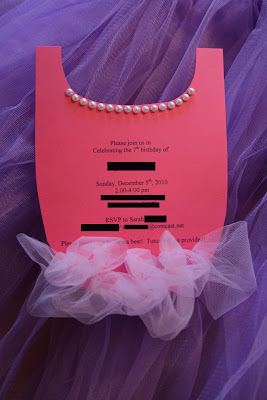 I used a small hole punch (that happened to be a small heart hole punch) and threaded a length of pink tulle back-and-forth through the bottom of the invitation to be the skirt of the tutu. At the neckline of the leotard I used a string of stick on faux pearls from the scrapbooking section of the craft store. I absolutely LOVE the ribbon canopy over the party table. The credit for this design goes to Glory of Glorious Treats. 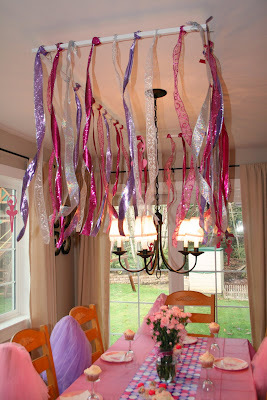 I came across a picture of a party she did for her daughter and knew I had to do the ribbon canopy for my daughter. It was AMAZING and my daughter and I both loved the effect! Look how pretty all those ribbons are! My husband built the framework for me out of some inexpensive wood and he and my preschool son painted it white. He screwed little eyehooks into it so that we could hang it from the ceiling per Glory's instructions. Then, one night after the children went to bed, we hung it from the ceiling using 3M Command Hooks--the ones with the little silver hooks. I tied all the ribbons on after it was already up on the ceiling. It took a LOT of ribbons! The runner on the table is wrapping paper from Target. On the center of the table I put out some sweet treats for the girls. In the milk glass container I piled up pink strawberry Whoppers and I used the curvy edges of the container to hold the candy dipped marshmallow pops. (They're just like the ones in this post from 2009.) There also are small containers of strawberry dipped Pocky sticks. The cupcakes are on inverted wine glasses from the Dollar Store. 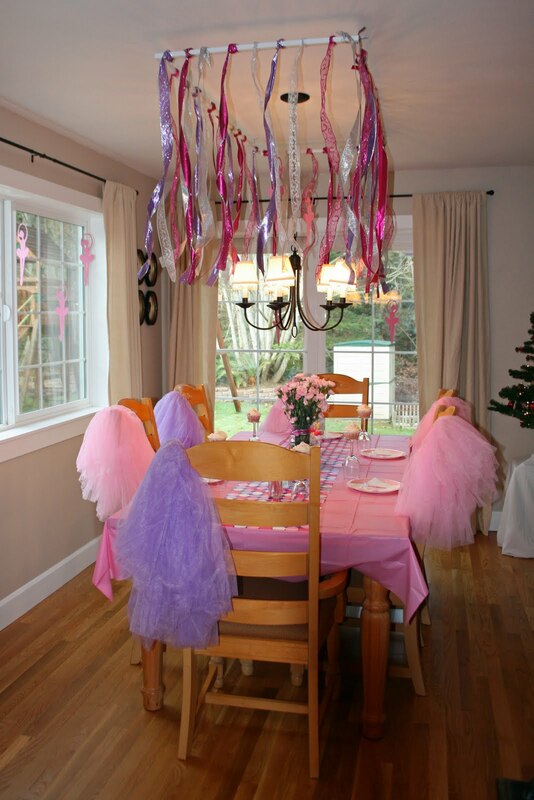 I bought those glasses last year for my daughter's Fancy Nancy birthday party. 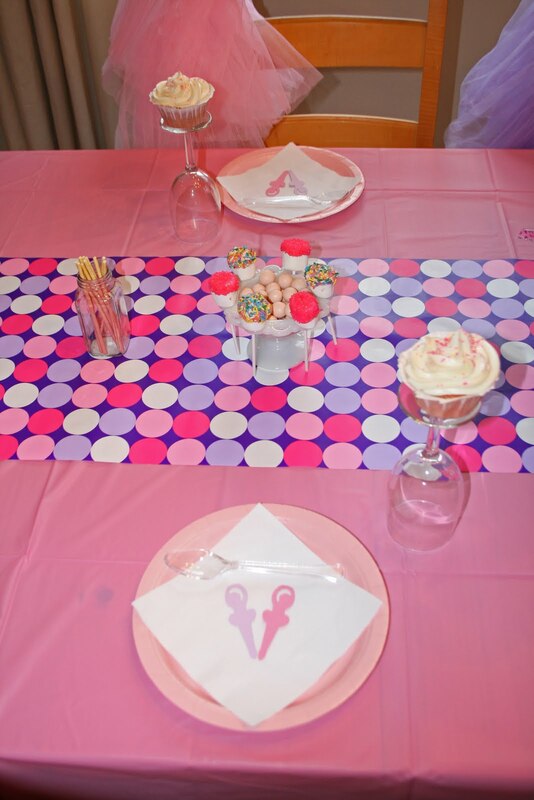 The ballerinas on the plates were cut with my Cricut. 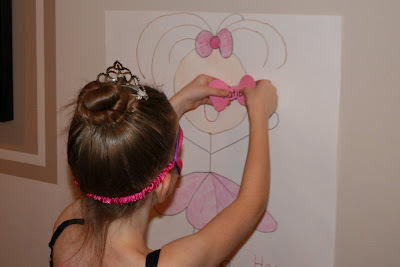 When the girls first arrived at the party, they socialized and colored ballet pages that I printed off the internet. Then they made these clothespin ballerinas. 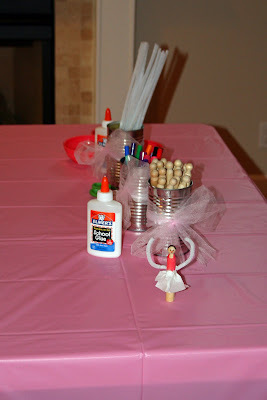 I had the supplies all organized for them in tin soup cans that I tied tulle around. The ballerina pictured here is a sample one that I made. It was really helpful to make a sample as it forced me to streamline the process and simplify things a bit. 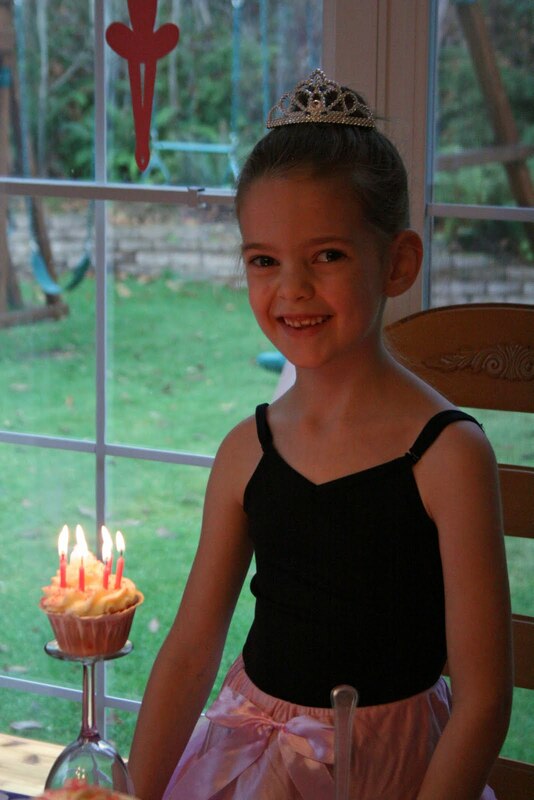 Next we had a ballet lesson from one of the senior company ballet girls from our dance studio. So exciting! She really worked those girls--it was fun to watch them! 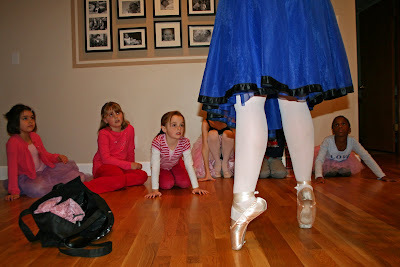 At the end of the mini lesson she got out her pointe shoes and those little girls were in awe! Next we did "pin the bow on the ballerina". Not exactly a traditional ballerina game, but it works for us as my little girl ALWAYS wears hairbows! I found this cute clipart image of a ballerina online and it was simple enough that I was able to freehand it onto some posterboard. I gave each girl a bow with her name on it and stuck a piece of tape on the back of it. After that we played "pass the parcel" before letting the girls make their own ice cream sundaes. 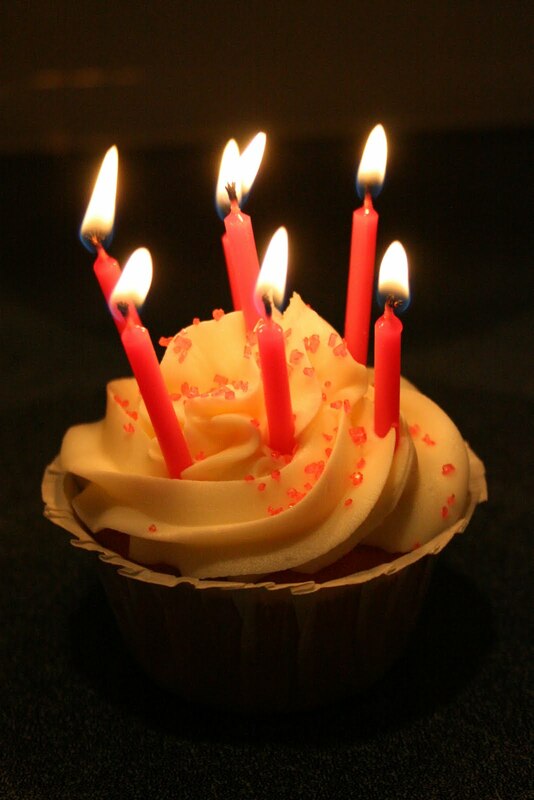 Happy Birthday, Pumpkin Pie! I love you now and forever! 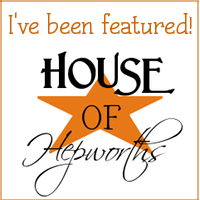 I'm linking to Whatever Goes Wednesday at Someday Crafts, Friday Favorites at Inspiring Creations, and Hookin' Up with House of Hepworths! Oh how fun! 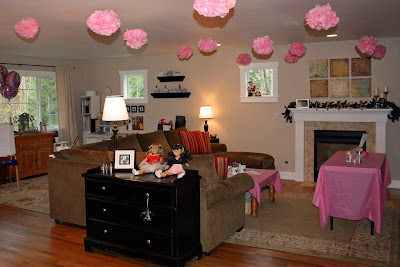 You did a great job decorating and the pictures are fun to look at for someone like me who is very visual. I'm a new follower from Catholic Mothers Online. Please stop by and return the favor. Wow that looks awesome! I'll have 3 boys soon, but hopefully when we get a girl or two they will love ballet as well. 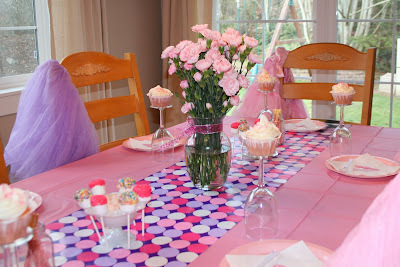 Such a sweet party! Its just sooo her! And I adore those puffs. And that invite. So cute! I love the invites! You did a great job. Oh, I'm in heaven after seeing this! You are amazing!!!! My daughter's 6th b-day party is this summer and I'm going back and forth between having it at home or a park. I love going to people's home for parties, it's always so more personal, so I'm leaning in that direction and this post has really inspired me. Great work mama!! !